Gansbaai is near Hermanus, which is near Cape Town! Scarlet Nguni, who hosts #discoverOverberg on Twitter, says "I think Gansbaai's De Kelders is such a divine spot I moved here after spending a night in the luxurious Cliff Lodge's Ocean Suite. Aside from offering sweeping views of sea and sky, it offers some of the best land based whale watching in the world. In season, you can sit on the rocks and watch southern right mothers and calves glide pass (and even breach) within as little as 5m. It's magical! Sunset and sunrises are picture perfect almost every day. Die Plaat offers long white side beach strolls, surfing and swimming. And although the Atlantic is often chilly, it's crystal clean waters make for the most delicious mid morning (and afternoon dips). There are a few stunning spots to stay - I highly recommend Cliff Lodge as it is situated, as the name suggests, on a cliff top overlooking the expanse of Walker Bay." Cliff Lodge only takes children from 10 years old and older. As they are situated on the cliffs, their pool is not enclosed and their balconies are not child safe, and this puts younger children at risk. As described above, the best room is the Ocean Suite. There is also a North Room which is sea-facing, a South room an East Room and a West Room. Choose the Ocean Suite on the top floor of Cliff Lodge for privacy & views. Soak up some rays on the deck whilst enjoying the pool & views. At its best during whale season. Ask owners to arrange a massage. 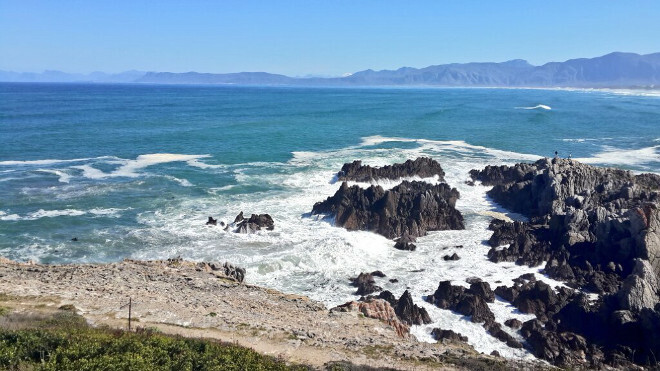 To get to Gansbaai, fly to CPT, hire a vehicle at Cape Town International Airport and then enjoy the 147km drive to the south-east (take about 2 hours). Simon Burnham, a British Commercial pilot now residing in South Africa, says that "I would Have to say My favorite Place in South Africa is Umhlanga. Umhlanga is a perfect place to bring your family for a holiday, clean beaches clear blue water and great places to eat out. My family from the UK visited it and fell in love with the place and have told all their friends back home to visit. I would strongly recommend to stay at the Oyster Box (Ed: the Oyster box was recently voted the 10th best hotel in South Africa - making it the only establishment which appeared both in that vote as well as the top coastal accommodations) - an absolutely stunning hotel with a colonial feel with a great curry buffet lunch and a traditional English afternoon tea. After you have eaten you walk out side to a stunning view of the sea with an infinity pool to relax in. I spend most of my evenings in the cafe having coffee because I love it there so much after a long day at flying." Another good spot to stay in Umhlanga is the Teremok Marine (A kilometre from Umhlanga Rocks on Marine Drive). Close to the sea. Choose the milkwood suite, with its view over the sea from a private balcony and huge bedroom. The Beverly Hills in Umhlanga was recently voted the 8th best hotel in South Africa. To get to Umhlanga, fly to Durban's King Shaka International Airport; and it is some 15 minutes drive south of the airport. Pat Mokgothu wrote to say that "My favourite coastal spot is Myoli Beach in Sedgefield. It's a small town with friendly people". A good spot to stay in Sedgefield is Shearwater on Sea, 50m from Myoli Beach. To get to Sedgefield, hop onto a flight to George, hire a car & then it's a 40 minute drive to the east of the airport. Going over the Kaaimans River Pass, and through Wilderness; the drive is one of the most beautiful in the world. Andre Beukes, who runs a number of social media accounts in the travel industry, says that "My Favourite spot has to be Gordon?? ?s Bay and the spot to stay at has to be Gordon?? ?s beach Lodge. This town is like a holidays paradise, I think the word Miami comes to mind when you walk along the beachfront. On the one side you have the beach and on the other side you have restaurants bars little shops with quaint names like bikini beach etc some fashion shops and even a book shop on street level. The atmosphere is one of laid back relaxation and planning where to have lunch or supper, which restaurant to pick and what you can have to eat. The choices is huge, from red meat to pizza to seafood to vegetarian here they cater for all tastes. Gordon?? ?s beach Lodge breakfast is well known around the world even as far as Russia, Sweden and the United Kingdom." 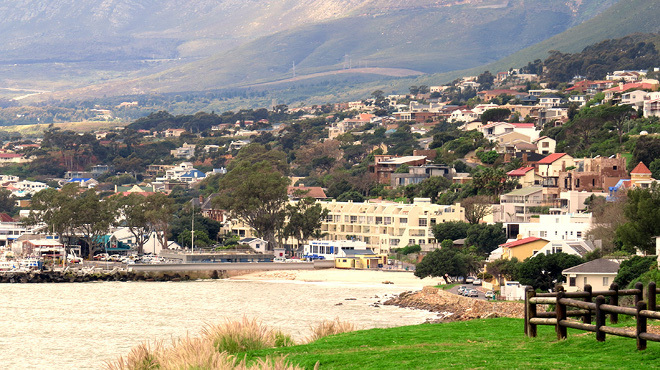 To get to Gordons Bay you would once again fly to Cape Town International Airport, and then hire a vehicle and it's a half hour drive to the south-east. 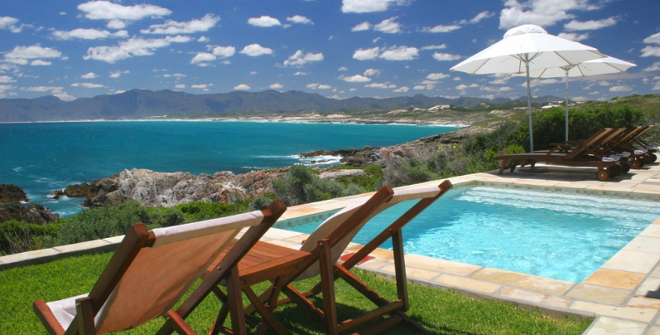 Annie Lehmkuhl, a travel-coordinator, chooses Monkey Valley Resort : "Noordhoek Beach is one of my favourite beaches. The resort is perfectly situated with self-catering thatched cottages in a milkwood forest with gorgeous views of the Atlantic Ocean and Chapman?? ?s Peak. The treetop pub and deck is great for sunset drinks. There's beach walks, horse riding, hiking, and visiting the many interesting little shops in the village. Again, an ideal place for peaceful relaxing or romantic weekends." To get to Noordhoek, hop onto a flight to CPT, rent a car and it's a 40 minute drive to the south-west. 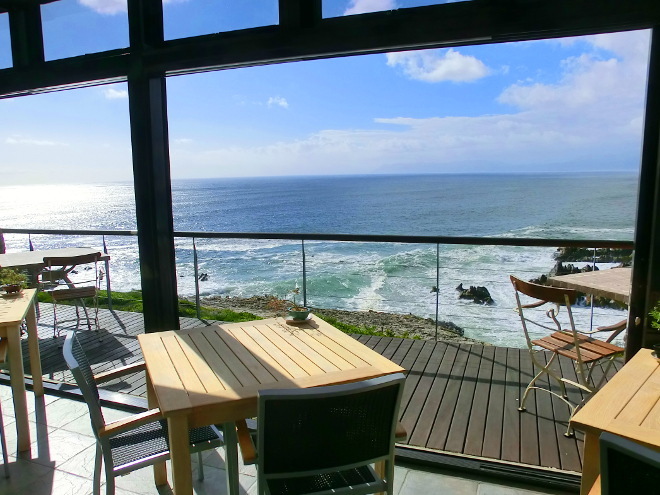 Cliff Cottage B&B, Hermanus. Close to the centre of Hermanus and across the road from the cliff walk. For extra privacy request the garden cottage behind the main house. The Old Trading Post, Wilderness, next to the lake, and close to a few hiking trails - birdwatchers will like it. Families will prefer the Strelitzia Room, otherwise ask for the Garden Room. Dolphins View Guest House in Beachview near Port Elizabeth. Choose a room with a balcony on the upper level, for the views. Tranquility Guest House, Fish Hoek (Cape Town), for its views. Ask for the loft room. Parker Cottage in Tamboerskloof, Cape Town. Close to restaurants, and a short walk from Long Street, the pulse of Cape Town. Splurge on a bigger room for a bit more comfort! Candlewood Lodge, Knysna. Go for an upstairs room with views of the lagoon. The Petite Provence B&B in Salt Rock. Close to King Shaka International Airport. Walking distance from 2 restaurants & beach. Berg & Zee Guest house in Gordon's Bay for being right across the road from the beach, and its views over False Bay (top floor rooms are best). A short walk from Bikini Beach, where the students like soaking up the sun - one of South Africa's few Blue Flag beaches. Leave your sliding doors open at night & listen to the ocean. The Grange Guest House, located in Durban North. Close to restaurants. Request a room with a view. Good spot to stay at before your cruise from Durban on the MSC Sinfonia or Opera. Christiana Lodge, a guest house in Plettenberg Bay, with its views over the marshy wetlands from the balconies, from which you can hear the frogs croaking at night. Upstairs rooms have better views. Robberg Beach is five minutes away by foot. Free Wi-Fi (use it to share your photos!). If you're looking for a holiday in Cape Town, try the Liberty Lodge B&B, Tamboerskloof (Cape Town). This place has a history! Started life as a "Victorian gentleman's house", progressed to being a house of ill repute in the swinging 40s and now a guest house. Room tips - Ghandi & Madiba have good views and lead onto the terrace. On the Spot B&B at St Francis Bay (between Knysna & Port Elizabeth, close to Jeffrey's Bay), for its solitude, close proximity to walks along an uncrowded beach, and the friendly couple who run it. Great place for some R&R. Enjoy the pool. Have we missed your spot? Tell us about it, and we may include it Email cheapflights@southafrica.to (include photos).